In the Cat's seventh game of the season and the first of two back to back road games, the Cats travel to Macon, GA to play the Mercer Bears. Western faces the Bears for just the fifth time since Mercer joined the Southern Conference. Games that will be played by the Bears this season prior to the WCU contest: (6 games) The Bears kick off the season in Memphis. TN against the Memphis Tigers, before returning home against the Pioneer League's Jacksonville. The Bers then travel to Birmingham to meet the Samford Bulldogs, then return to Macon to host The Citadel, then travel to Lexington to meet VMI, then remain on the road traveling to New Haven, Conn. to face Yale. The Series: In only the 5th meeting between the two teams, the Cats own a 2-2 record against the Bears, having dropped the last two games played, one in Macon and one in Cullowhee. Last Season's Game vs. Mercer (Nov. 10, 2017) Turnovers, Special Teams Lead Mercer Past No. 25 Western Carolina, 35-33 - Tyrie Adams threw for a season-high 378 yards and three touchdowns as No. 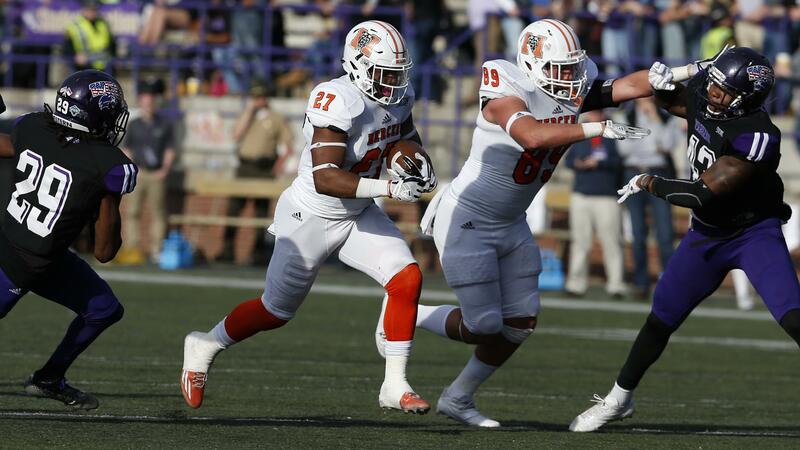 25 Western Carolina tallied its third-highest total offensive output with 507 yards on Saturday afternoon. However, costly turnovers and big plays in the special teams by Mercer guided the Bears to the upset victory over the Catamounts, 35-33, on Hall of Fame / Senior Day at E.J. Whitmire Stadium / Bob Waters Field. Head Coach: Bobby Lamb enters his sixth season as head coach of Mercer football. Named the 19th head football coach in program history in 2011, he led the Bears to immediate success, claiming the third 10-win season of his career and setting the NCAA Division I record for wins by a first-year program with a 10-2 campaign. The 2013 win total also set a school record for victories, surpassing the previous mark of seven wins by Lake Russell’s 1931 and 1932 squads. For his efforts, he finished third in the PFL Coach of the Year voting and ranked among the top 11 finalists for FCS National Coach of the Year.. In the offseason, HC Bobby Lamb hired a new offensive coordinator/quarterbacks coach Joe Pizzo, safeties coach Mitch Doolittle and cornerbacks coach Darius Safford in addition to three other title changes on his coaching staff. Offensive line coach Casey Vogt will serve as Running Game Coordinator while running backs coach Carter Barfield will be the Co-Recruiting Coordinator alongside La'Donte Harris. Pizzo most recently held the same titles at NCAA Division II North Greenville, Doolittle returns to Mercer after spending one season at PC as their DC, Safford comes from West Georgia. Game prediction: Per the Massey Ratings, the Cats have a 39% probability of winning (27-31) over the Bears. According to Massey, Western Carolina should be 4-3 after this game. I'm going to disagree, the Cats are 6-1 after this game.